Magnetic nanoparticles (NPs): are laboratory synthesized particles whose size are between 10nm and 100nm, having magnetic properties of great interest for many applications. In many cases these nanoparticles are suspended in a fluid, what is called magnetic colloid or ferrofluid. A nm (nanometer): is a millionth of a millimeter. 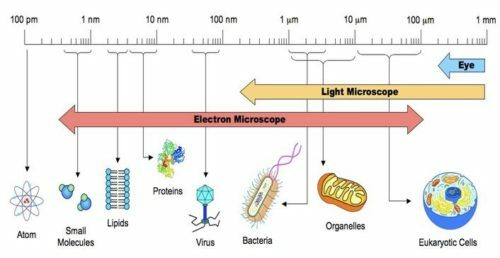 In comparison, a 10nm NP is approximately 1000 times smaller than a white blood cell in the blood and in turn, an atom has an average size of 0.1 nm. Nanoparticles are among the smallest object which may exist in nature. MnH ( Magnetic nanoHeating): Magnetic heating consist on the heating of a magnetic material through the application of an alternating magnetic field. The term MnH is the way we refer to magnetic heating of nanoparticles. SAR (Specific Absorption Rate): is defined as the amount of energy/power absorbed by the sample per mass unit [ W/kg ] . As the power absorbed by the magnetic colloid during CINPs experiment, assuming an adiabatic system, it is equivalent to the generated heat per time unit, the SPA (Specific Absorption Power) can also be defined as the amount of energy converted to heat per time and mass unit. In many documments SPA and SAR are used interchangeably. ILP (Intrinsic Loss Power): SPA values ​​of the same colloid measured under different experimental conditions (amplitude and frequency of the applied magnetic field) will be different, making impossible to directly compare results obtained in different laboratories or equipment. For this reason this new index has been proposed, it is independent of the field used and the equipment. It is defined as the ratio between the SPA value and the product of frequency by square of the the applied magnetic field intensity. CINP: inductive heating of nanostructured materials . CAL: accessory calorimetry and measurement of SAR (designed for DM2). CAT: DM2 Controlled Atmosphere and Temperature cell culture holder (designed for DM2). HBM: DM100 HeartBeat Monitor system for small animals (designed for DM3, compatible with DM2).